Attention Construction Companies, Contractors, Building Owners, Management Companies and Business Owners! NEW FDNY Tags are Required on All PFE’s by November 14th, 2019! 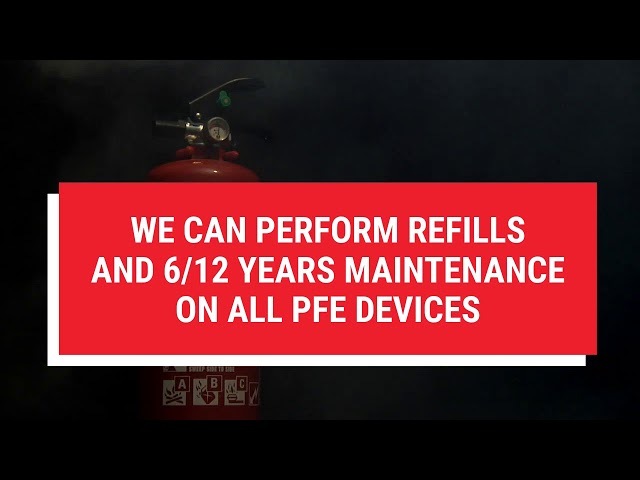 The NYC Fire Code (3 RCNY Section 115-02) requires the periodic inspection and servicing of portable fire extinguishers and commercial cooking exhaust systems. A rash of unscrupulous companies providing bogus services led to fires and significant injuries and loss of property. These senseless and preventable fires triggered a change in the NYC Fire Code. The new code calls for the use of only approved companies to provide the sales and services of portable fire extinguishers and the cleaning and servicing of commercial cooking exhaust systems. To prevent fraud and as an added measure of proof of compliance, the approved companies will use specifically numbered tags issued by the FDNY. Only companies that meet the NYC licensing standards are eligible to purchase the Fire Department issued tags, and only FDNY – issued tags will be acceptable proof of the inspection, cleaning and/or servicing. The tags will be designed with various security measures to prevent counterfeiting. All fire extinguishers must have new FDNY issued tags provided by an authorized provider such as Safety Supplies Unlimited. The law went into effect on November 15th, 2018, which required any fire extinguisher that was due for an annual inspection to receive the new FDNY issued tags. The FDNY allowed a 1-year grace period to allow contractors, business owners, construction sites, etc. to schedule their annual inspections for their units and comply with the new rule. By November 15, 2019, ALL fire extinguishers must have these new tags affixed onto them. HOW CAN SSU HELP YOU? SSU is an FDNY authorized provider of fire extinguishers in NY and NJ. We can inspect and retag your extinguishers for FDNY compliance. Our company will assist you to comply with this new regulation. SSU will replace all tags for current clients or new clients AT NO ADDITIONAL FEE as long as SSU performs the annual inspections required on your fire extinguishers. Our certified Technicians will be available to swap out old tags with new tags on your site. SSU will ensure that your job remains safe with the right fire safety equipment and with proper tags, inspections, and repairs. The new FDNY issued tags contain new security measures such as holograms and barcodes to prevent fraudulently reproducing these tags. 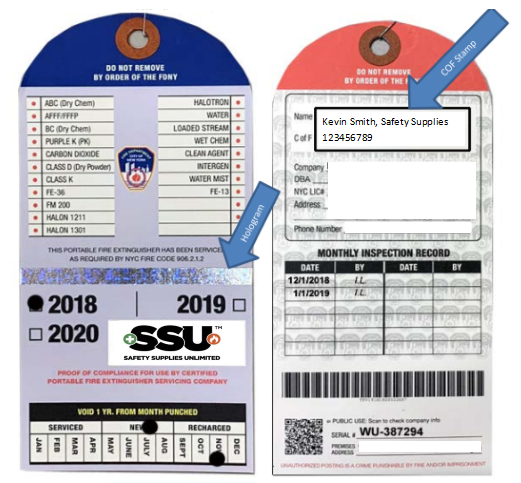 Only FDNY approved providers can purchase these tags directly from the FDNY (using a third party) and no other tags will be recognized by the FDNY. Contact SSU today to schedule your service appointment!